Perennial; blooms June to August. Root buds produce trailing reddish stems with sharp spines that can grow more than 20 feet per season. Leaves alternate, palmate, and compound with serrate margins. Flowers five-petaled, white to light pink. 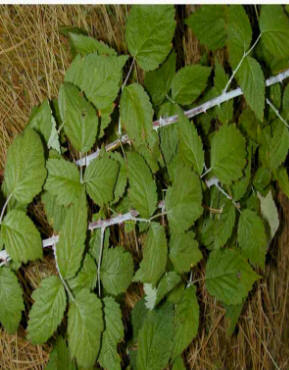 Himalayan blackberry is the most widespread and economically disruptive of all the noxious weeds in western Oregon. It aggressively displaces native plant species, dominates most riparian habitats, and has a significant economic impact on right-of-way maintenance, agriculture, park maintenance, and forest production. It is a significant cost in riparian restoration projects and physically inhibits access to recreational activities. It reproduces at cane apices (tips) and by seeds, which are carried by birds and animals. This strategy allows it to expand quickly across a landscape or to jump great distances and create new infestations. Type and Class of Livestock: Goats and sheep. Grazing Objective: Browse blackberries season long to achieve and maintain 95% stem defoliation or complete removal of young stems. Growth Stage for Treatment: Livestock, especially goats, will readily consume blackberry seedlings and early-season growth. However, sheep or goats can browse blackberries year round, with average stocking rates of three to four animals per acre. Potential Effectiveness: Goats are ideal for browsing blackberries, because they will consume the entire plant year round. Sheep will eat blackberries but not to the same extent as goats. Goats have the potential to destroy all top growth in a single year of grazing. Shrubs will regrow if grazing stops before the entire plant is destroyed, which may take a few to several years. Season-long browsing may require supplemental feeding of hay during the winter to maintain animal body weight. Grazing by goats or sheep is less costly than chemical or mechanical control of blackberries, especially in rough terrain. However, grazing can be integrated with herbicides or mechanical control. Any control strategy can be considered short-lived unless projects are planned and funded for the long term. Coos Soil and Water Conservation District. 2000. Grazing for control of Himalayan blackberry. Available at: http://coosswcd.oacd.org/him_blackberry_text.htm. Accessed 12 July 2006. DiTomaso, J.M. 2002. Pest notes: Wild blackberries. IPM Online. Available at: http://www.ipm.ucdavis.edu/PMG/PESTNOTES/pn7434.html. Accessed 12 July 2006. Faithfull, I. 2004. Blackberry management. Land Care Note LC0381. Available at: http://www.dpi.vic.gov.au/DPI/nreninf.nsf/ Accessed 12 July 2006. Tasmania Department of Primary Industries, Water, and Environment 2002. Blackberry (Rubus fruticosus aggregate). Available at: http://www.dpiwe.tas.gov.au/inter.nsf/WebPages/RPIO-4ZW2MF?open#IntegratedManagement . Accessed 12 July 2006.